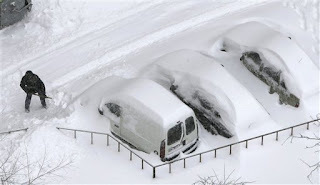 KIEV, Ukraine -- The city of Kiev has declared a state of emergency after the Ukrainian capital was paralyzed by an unprecedented snowstorm that has stalled car, railway and air traffic. A driver shovels snow off his vehicle in Kiev, Ukraine, Saturday, March 23, 2013. Heavy snow storms from the Balkan region have been stricken Ukraine since last afternoon, in the last winter attack at the end of the first spring month. The city was hit by about 50 centimeters (20 inches) of snow in the past day, more than it usually receives per month during this season. Tractors, armored vehicles and other heavy equipment were dispatched Saturday to clear roads blocked by kilometers-long traffic jams. Desperate to get home, some Kiev drivers simply abandoned their stalled cars on the roads and set out on foot. Kiev's main airport, Boryspil, was working with delays, the smaller Zhulyany airport was closed and Ukraine's International Airlines grounded all its planes until Sunday morning.